Out of its intensive development programme for variable flow and high-efficiency pumps for diesel engines, Concentric has evolved a new modular approach designed to let customers choose pumping solutions of varying sophistication on the same engine and within the same space envelope. The approach acknowledges the need of global manufacturers to offer different levels of technology in different markets. At the top end, Concentric's latest variable flow technology (VFP) can offer fuel savings up to 4% , but where there is no requirement for this, a conventional pump can be fitted without any further modifications. The Concentric approach is to offer a family of pumps so as to ensure maximum flexibility within what is ultimately a bespoke design for each application. 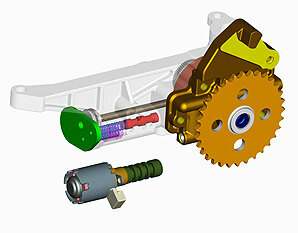 The family consists of three members: one of two variable flow options, configured either in an entirely mechanical format or electronically controlled and third, a conventional fixed displacement pump. Each member of the family has the same base pump design and so benefits from commonality of the major components, while packaging within the same envelope. Business Development Director Kevin Johanson commented: "Concentric variable flow technology is extraordinarily versatile. From mechanical to electronic control is as easy as substituting one control valve for another at the build stage. Similarly, if a niche market doesn't require control, it's simply removed along with any associated cost. Our variable flow technology is equally applicable to gasoline and diesel engines and in future, many of our customers will take the benefit of a single product family, irrespective of engine fuelling." Concentric's VFP is an annulus and rotor pump that operates by matching oil supply to demand, so limiting the power needed to drive the pump and hence fuel consumption. Originally developed for heavy-duty diesel engines, the design has now generated a number of scaled down versions, most of which are operated electrically via a standard solenoid valve rather than mechanically. The Concentric VFP uses two rotor sets to control oil flow in relation to three conditions- engine load, temperature and pressure. The driving rotor operates in the traditional, fixed arrangement, while the offset position and resultant flow of the second, eccentrically-mounted rotor is controlled either mechanically or electrically. The electronic control system is compact, compatible with all passenger car applications and failsafe. It is extremely robust and, in the event of an electrical failure, would continue to operate as a variable flow pump. Concentric VFP Limited is a subsidiary of Concentric plc, a major supplier to the world's, truck, agricultural and construction equipment industries with plants in the UK, USA and India. In addition to oil, fuel transfer and water pumps for diesel engines, the group also manufactures lubrication pumps for transmissions and compressors.